“The reasoning behind the theme is that we recognize that health is more than just the physical. It also includes the economy and the society,” said Eric Levy, co-chair of the Atlantic Conference on Public Administration (ACPA), which hosts the annual student-led conference. This year’s two-day conference featured expert panel discussions on the current economic and demographic state of Atlantic Canada, international trade, and the relationship between healthy people and healthy communities. School of Public Administration instructor Jenny Baechler led a design-thinking workshop. The hands-on activity allowed delegates and students alike to share ideas and discuss how to move innovation into practice by digging into human-centered design. “It’s in understanding how and why people act, think, feel and behave that informs the creation of new and innovative ideas that can have positive impact on our communities,” said Dr. Baechler in remarks during the session. During Dr. Baechler’s session, participants were required to come up with innovative ideas on how to encourage more Nova Scotians to prepare and eat more meals at home. In this scenario, individuals were expected to interview one another in order to gain more insights into food choices and the motivations behind them. This was followed up by a brainstorming activity to identify solutions based on unique needs of the group. Dr. Baechler also celebrated other innovative approaches used at the conference this year, including ‘solution rooms’ and ‘soap-box’ presentations. The former provided a deep-dive into different areas of interest with the aim of coming away with tools and tactics that can be put into practice. The latter centred around energetic and compelling speakers who showcased — in 20 seconds with 20 slides — timely and innovative projects that are having a positive impact on Nova Scotia communities. The conference’s keynote address, hosted by the MacEachen Institute for Public Policy, was delivered by Scott Brison, former president of the Treasury Board of Canada. Other notable speakers were Thomas Storring, director of economics and statistics at the Nova Scotia Department of Finance and Mike Davis, managing director with Davis Pier Consulting. Students from various departments were given an opportunity to present papers on some of their best work. 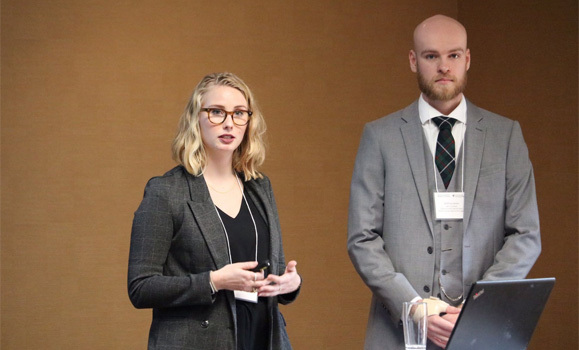 The winning paper by Emi Froud and Joshua Jones (pictured below), second-year students from Dal’s School of Public Administration, focused on business innovation and findings for enhancing Atlantic Canada’s innovation ecosystem. A common practice of the conference is to present the annual public service inspiration awards to public servants who inspire and mentor students and colleagues in their personal and professional lives. This year’s awards were presented to Lynn Adams, the director of energy and environment policy and coordination at the Atlantic Canada Opportunities Agency (ACOA) and Sharon Murdoch, a former special advisor to the associate deputy minister for diversity and social inclusion with the Department of Health and Wellness. A networking social event hosted by the Province of Nova Scotia provided an opportunity for students and professionals to mingle and establish connections based on their common interest in public administration.